Deliver and assess SITXCRI001 Respond to a customer in crisis using RTO training and assessment materials from one of Australia’s leading RTO training resource developers! The training resources are delivered in editable Word format and will be branded with your logo before delivery so you can complete your resource setup and begin SITXCRI001 Respond to a customer in crisis training delivery as quickly as possible! Contact us today for more information, samples and pricing for your new SITXCRI001 RTO training materials. Get a complete SITXCRI001 Respond to a customer in crisis training resources kit so your RTO can deliver and assess this popular unit of competency separately or as part of a high-value vocational qualification! This package will provide your RTO with SITXCRI001 materials designed to help your students develop desirable skills and knowledge to increase their employability and pursue new career opportunities in the Hospitality industry. 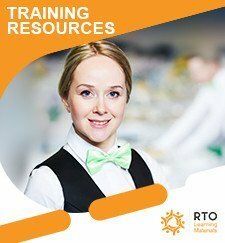 This unit from the SIT – Tourism, Travel and Hospitality is provided in editable Word document format so RTOs are able to modify the resources in order to comply with internal or external validation outcomes, internal or external audit recommendations, an update of training package/units, third-party licence obligations. This VET training resources package includes training materials for a single unit of competency, SITXCRI001 Respond to a customer in crisis. Using these RTO materials, you can deliver this UOC as an individual unit, as part of a skill set, or as a core or elective unit in a qualification. For more information about the SITXCRI001 Respond to a customer in crisis unit, including qualifications that include this unit, elements and performance criteria, performance evidence, knowledge evidence, and assessment conditions, check the official training.gov.au page here – SITXCRI001 Respond to a customer in crisis. Our unlimited student license model means you purchase the SITXCRI001 training resource once and deliver and assess training for as many students as you want with no additional fees! The license terms allow your RTO to modify these training resources in order to comply with internal or external validation outcomes, internal or external audit recommendations, an update of training package/units, or third-party licence obligations. You may also print unlimited copies of the SITXCRI001 materials for the purpose of training and assessing your students and/or clients. Your new Respond to a customer in crisis learning and assessment materials will be delivered in editable Word format and will be branded with your logo before delivery. Enquire now and get this premium SITXCRI001 Respond to a customer in crisis learning and assessment resources bundle for your RTO today! You will receive training materials to deliver and assess a single unit of competency, SITXCRI001 Respond to a customer in crisis. This unit of competency may be available as part of qualification packages. Additional SIT training materials and other resources are available for purchase, so search our store or contact us now for more information and pricing. Resources developed by LRES Training Management Pty Ltd are provided with a “One-Off” License Fee with Unlimited Students – meaning you pay one upfront fee and there are no ongoing per-student or annual license fees! These training materials will be licensed to your RTO for use in delivery and assessment of SITXCRI001 training for your students only. This training resource has been written to meet the training package requirements for the SITXCRI001 unit of competency, part of the SIT – Tourism, Travel and Hospitality. This unit is provided “as is” without guarantee, warranty or condition of any kind. This is SITXCRI001 Respond to a customer in crisis learning resources package from the SIT training package is written and maintained by LRES Training Management Pty Ltd. Licensing for this unit of competency will be provided by LRES Training Management Pty Ltd. Compliant Learning Resources is proud to partner with LRES to market and distribute their RTO training resources to TAFEs and RTOs across Australia and overseas.